People aren’t kidding when they say your child’s first year flies by. I feel like we just brought our baby boy home, but last weekend we celebrated his first birthday! 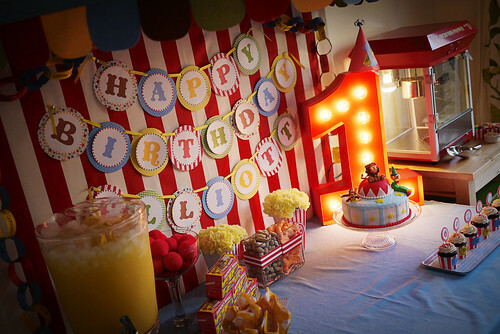 Any and all party planning credit needs to be split with Pinterest. I pinned the stuffing out of this party. 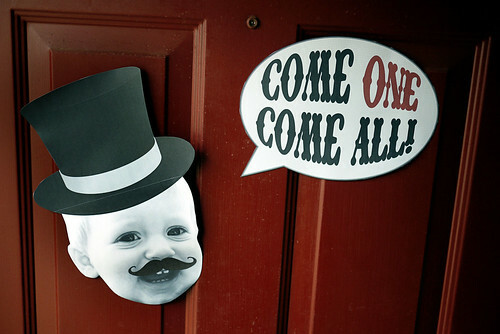 First up we have the birthday boy as a ringmaster, greeting guests at the door. Here’s the most finished shot I have of the party spread. Too busy enjoying myself to get a final picture! The canopy is from IKEA (MYSIG), as is the red striped fabric (SOFIA). 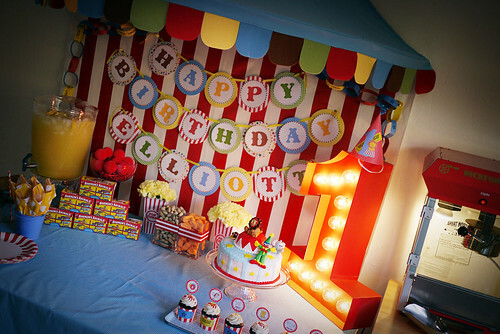 The banner is made from scrapbook paper, white cardstock, and ribbon. 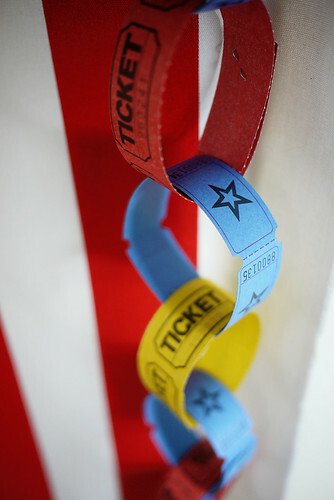 Staples transformed raffle tickets into a festive chain garland. 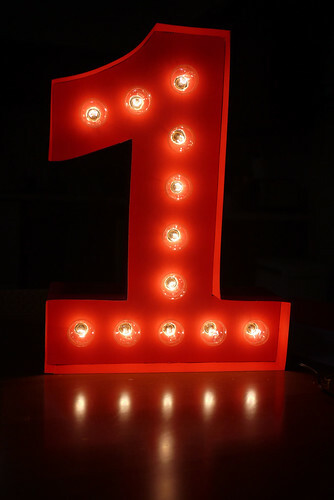 The marquee number one is made from posterboard, foam core board, and string lights that I already had. I’m so happy with how the decorations turned out! Lots time spent during naps and after Elliott’s bedtime brought it all together. My mother in law made this beautiful and delicious cake for the occasion. I was blown away! 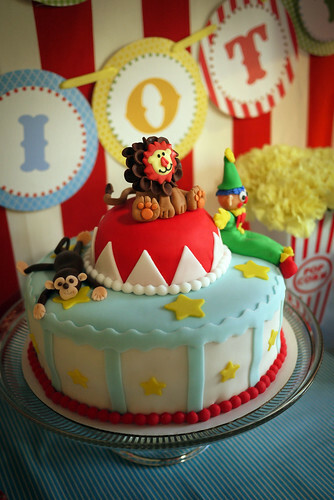 Can you believe it was her first time ever working with fondant? 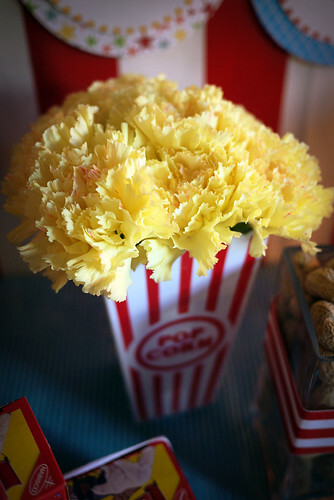 These yellow carnation “popcorn” arrangements were one of my favorite details. 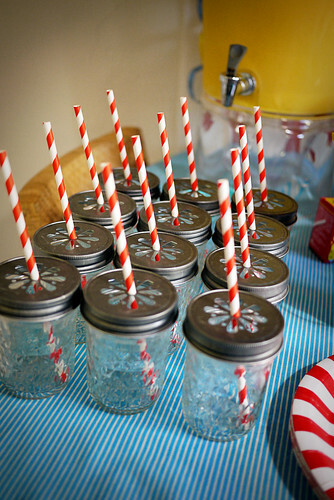 Paper straws and daisy lids transformed canning jars I had on hand into glasses for the pineapple lemonade punch. 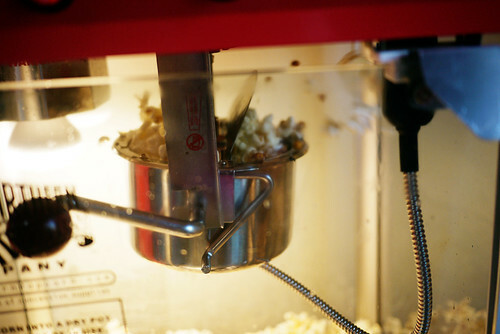 The popcorn maker was borrowed from my parents. 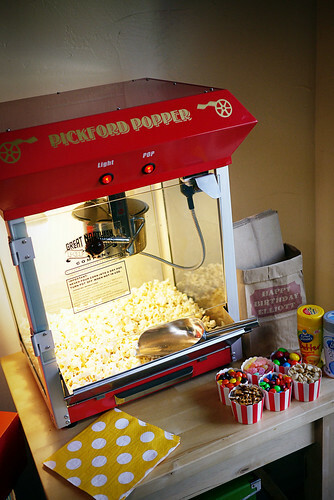 I made a mini popcorn bar with candy and savory snacks to mix in. Word to the wise – use coconut oil. It tastes like it came right out of a theater bucket! I ran paper bags through our printer to make custom popcorn bags. Still can’t believe that worked! I was sure this was going to be a failed project. 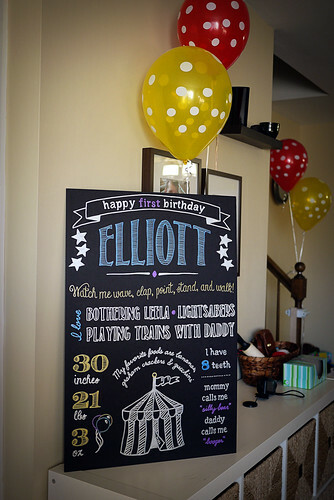 There’s chalkboard inspiration to be found all over Pinterest. 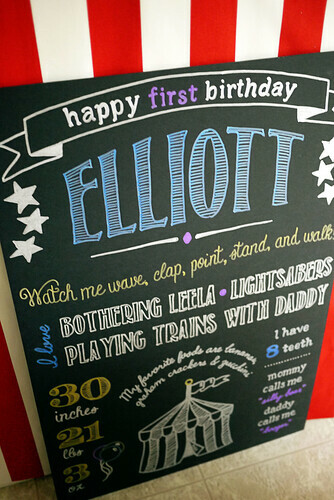 Here’s my attempt, with black foam core board and metallic markers. 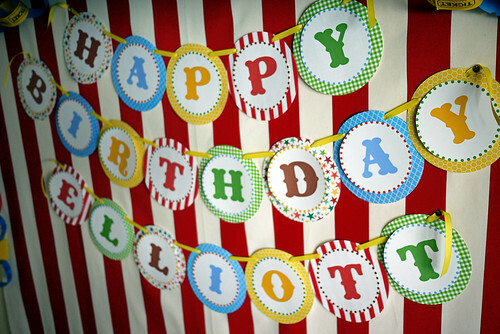 Paired with polka dot balloons! 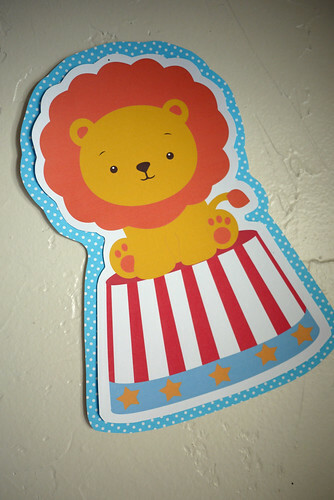 I bought some circus-y clipart on Etsy and blew it up for decorations. 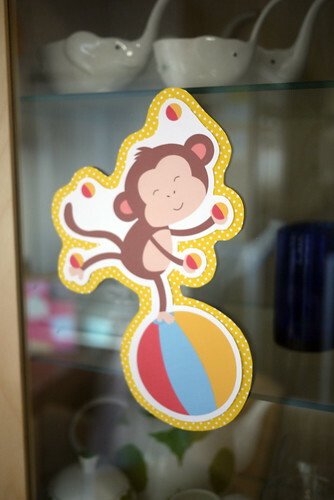 Printed on cardstock, trimmed, and mounted on polka dot cardstock. 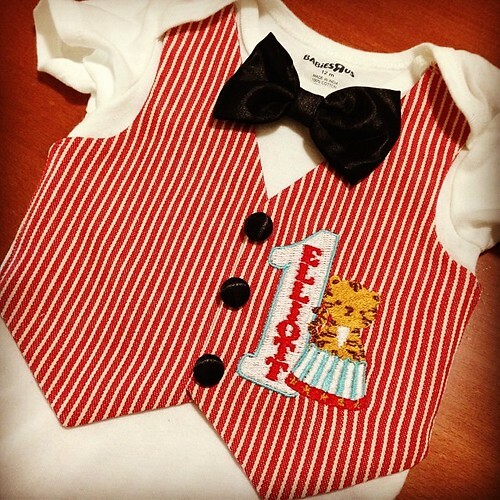 I used the same clipart (and a Husqvarna Designer SE) to embroider a custom onesie for Elliott. The buttons and bowtie are repurposed from a teeny tiny tux he wore at four months to a black tie event. I think he looked smashing! 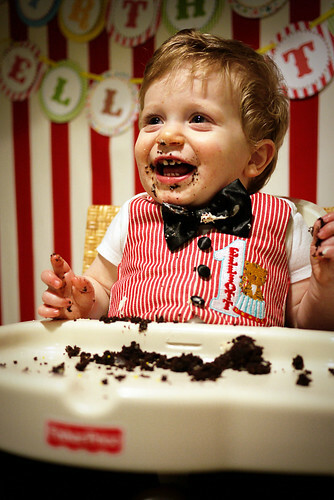 And not just because he adorably slathered himself in cake. 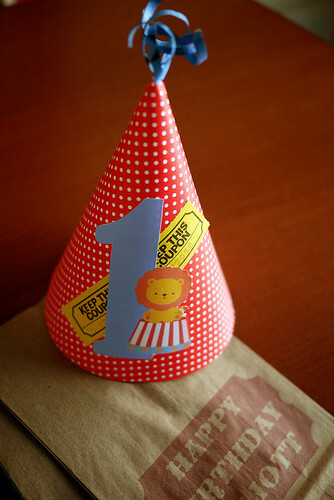 I even made a little party hat, which was soundly rejected by the guest of honor. 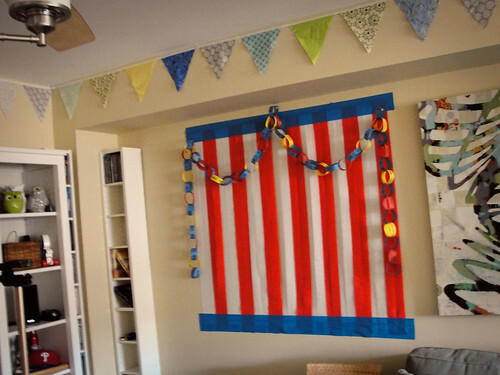 Here’s the $2 photo booth backdrop I made from crepe paper and painter’s tape. We took photos with a camera on a tripod, and I used PhotoFunia’s photo booth tool to make the authentic-looking strips below. All in all, a wonderful day with wonderful people. 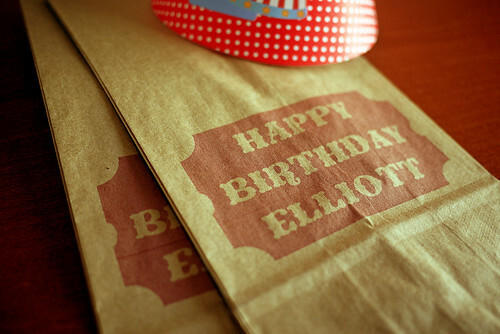 Happy birthday, Elliott!